Click here to Download PG Course Admit Card. For any queries about Admit Card of Entrance Tests 2018-2019 Contact at 0177-2833648. Kindly note that Students of UG First semester Session 2018-19 can download their admit card to confirm their Exam Roll Number. For any queries about Admit Card of Entrance Tests 2018-2019 Contact at 0177-2833648. For any queries about Under Graduate Result/Marks Entry Problems (B.A, B.Com, B.Sc etc) Contact at 0177-2833592, 0177-2831959. Click here to check the DOS Entrance Exam Schedule and " Admit cards will be available for download from 5 days before the date of entrance exam". Admit Card can be downloaded for the following programs. 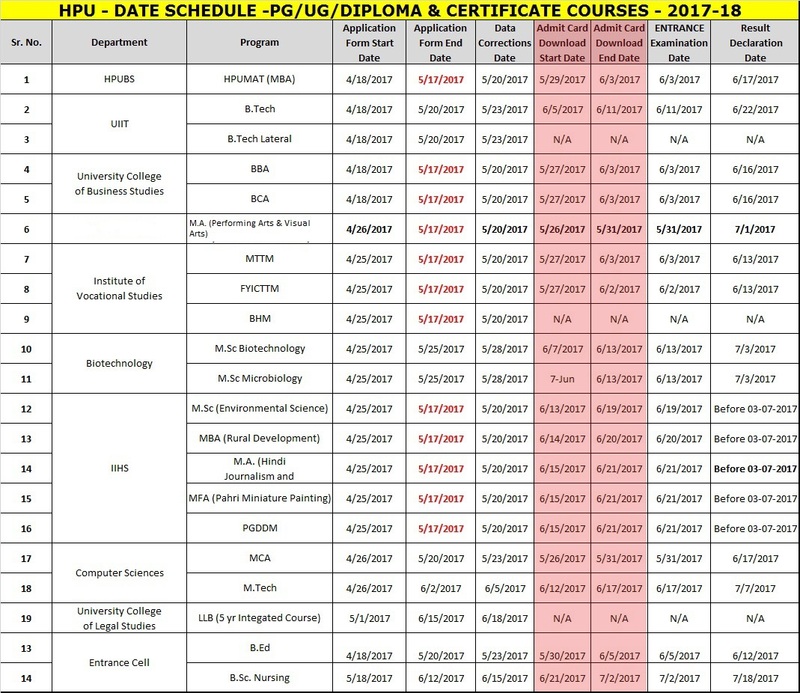 CLICK HERE to Download Admit Card schedule for other programs. 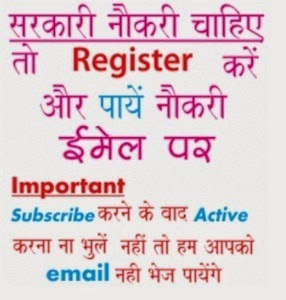 In case of any issue related with Admit Card Download Kindly log your issue by using Help Link at the right to of the page. HPU BAMS Prof 3 year, B.Ed Entrance, B.Tech 1/3 semester, PGDCA 1/2 semester, MTA 1/2/3 semester, B.Pharmacy 1/3/5/7/8 semester Exam Results (Gazette): Himachal Pradesh University (HPU) BAMS 3 year Professional result gazetted April 2015 exam released on 03 July 2015 and Bachelor of Pharmacy (B.Pharma) 8 semester on 22.06.2015 also Bachelor of Education (B.Ed) Entrance Exam Results released on 15 June 2015. The written test is going to held on 02 June 2015 also Bachelor of Technology (B.Tech) 1/2 semester results gazetted on 15.05.2015, Post Graduate in Computer Applications (PGDCA) 1/2 semester results gazetted on 13.05.205 and Bachelor of Pharmacy (B.Pharmacy) 1/3/5/7 semester on 11.05.2015 and MTA 1/2/3 semester results gazette on 08.05.2015 and written exams were successfully completed in November/ December 2014 and all appeared students can check their results from link given here. HPU M.Tech 2 semester, B.Tech 5/7 semester Exam Results (Gazette): Himachal Pradesh University (HPU) has announced Bachelor of Technology (B.Tech) 5/7 semester and M.Tech II semester results on 05.05.2015 also B.Tech IT 5/7 semester exam results gazette on 04 April and 25 March 2015 and written exams were successfully completed in December 2014 and all appeared students can check their results from link given here. HPU MBA 1/2/3/4/5, MCA 1/2/3/4/5 semester Exam Results (Gazette): Himachal Pradesh University (HPU) has display Master of Business Administration (MBA) 1/2/3/4/5 semester, Master of Computer application (MCA) 1/2/3/4/5 semester results gazette on 01 May 2015 and written exams were successfully taken in November 2014 and all appeared students can download their results from link given here. HPU MA Hindi/ Political Science 1/2/3/4 semester Exam Results (Gazette): Himachal Pradesh University (HPU) has flashed Master of Arts (MA) Hindi 1/2/3/4 and MA Political Science 1, 2, 3, 4 semester results gazette on 16, 27 April 2015 and written exams were successfully completed in November 2014 and all appeared students can download their results from link given here. HPU MBBS Final Prof 2 Supplementary semester Exam Results (Gazette): Himachal Pradesh University (HPU) has announced Bachelor of Medicine & Bachelor of Surgery (MBBS) Final Prof II Supplementary exam results gazette on 01.04.2015 and written exams were successfully completed in December 2014 and all appeared students can get their results from link given here. HPU BBA 1, 3, 5 semester Exam Results (Gazette): Himachal Pradesh University (HPU) has announced Bachelor of Business Administration (BBA) 1/3/5 semester exam results gazette on 25.02.2015. The written exam were successfully completed in October 2014 and all appeared students can view their results from link given in this page. HPU BSC 2nd year Exam Results (Gazette): Himachal Pradesh University (HPU) has announced Bachelor of Science (BSC) 2nd year exam results gazette on 24.02.2015. The written exam were successfully completed in September 2014. Appeared students can see their results from link given in this page. HPU BCA 1st year Supplementary Exam Results: Himachal Pradesh University (HPU) has announced Bachelor of Computer Application (BCA) 1st year Supplementary exam results on 22.02.2015. The written exam were successfully completed in October 2014. Attendants can download their results from link given here.